With these ripping record players you can have all that lovely vinyl, but you only need to actually play it once. Result! Records are selling well. They're not troubling the most modern forms of consuming music, but album sales have been on an upward trajectory for several years now, and are at a 30-year high. That's partly down to a younger market that enjoys the 'retro authenticity' of vinyl, and a more long-standing band who favour the perceived warmth and accuracy of records over digital formats. Hipster wankers and crusty old gits, in other words. Just kidding! Now that you're starting to buy records instead of CDs, you'll be needing a turntable to jump onto this new-and-yet-old bandwagon. But being realistic, you'll also want to rip the music so you can retain it digitally as well. This prevents your records from degrading through being over-played. Many people also find it more convenient when on the move to use a mobile phone for music, rather than a record player and headphone amp, in a trolley. With standard turntables, this is where 'issues' arise. Just setting a turntable up can feel like a hobbyist faff of separate amplifier units, earthing and arm balancing. Then attaching all that to a laptop jacks up the faffiness to chaos-theory proportions. That's where USB turntables come in. As well as audio outputs, they have a USB connection, for (comparatively) simple analogue to digital conversion. 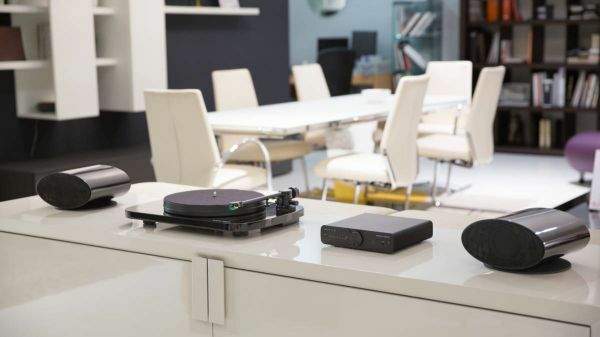 This Sony is our top pick as a USB turntable. That's because it not only plays vinyl extremely well – it'd be worth its high-ish price just as a standard turntable, in terms of audio quality and build – it also happens to have unusually good software for ripping your records. As well as MP3 and the usual lossy codecs, high-res audio is also supported – up to PCM 192kHz/24-bit or DSD 5.6MHz – if that's your bag, man. Unlike certain of the turntables here, it also just looks like a record player, with no garish novelty trappings. With the design an obvious “homage” to the legendary Technics SL1200 DJ decks, even down to the heavy plinth, direct-drive motor, S-shape tone arm, pitch control slider and stroboscopic speed marked platter, pleasingly this feels as bullet-proof (and weighty) as Technics' epic product. There's a selectable pre-amp, so it can be plugged straight into stereos via the RCA input, or turned off if you have a mixing desk or separate amp. And it sounds as sturdy, characterful and detailed as the build quality would suggest. Add a USB out so you can connect it direct to a PC to rip your vinyl and this a character-filled winner that's equally at home on a lounge shelf or blazing out La Macarena at Student Monday at Ritzy's. It's truly the first, genuine alternative to the SL1200. And our choice. Hands down. A slick, minimalist design statement that also happens to play vinyl, this is an oval of MDF with a DC motor on one end and a straight tone arm, optimised for Ortofon OM cartridges on the other. The USP here is its “central gravity mass point”, made from a material interestingly described as “artificial stone." This is placed underneath the platter bearing, with the idea to fully absorb rumble and motor vibration, negating the need for anti-skating doo-dads. Thread the belt through the motor and around the platter and you're good to go. It will need a pre-amp, though, or a powered amplifier, and it features a finicky belt-swapping 33/45rpm speed selector (you need to feed the belt through different size grooves on the motor). But set it up and it delivers a fine noise that belies its still-just-about-budget price. A slick, minimalist design statement that also happens to play vinyl, this is an oval of MDF with a DC motor on one end and a straight tone arm, optimised for Ortofon OM cartridges on the other. The USP here is its “central gravity mass point”, made from a material interestingly described as “artificial stone. The very definition of entry level. This is all you'll need to begin playing vinyl. An all-in-one turntable, it even sticks a brace of small speakers into the luxury, “wood effect” casing, although you can connect it to a stereo via standard RCA cables. Sound and build quality accurately reflect its price, but you can rip to your PC and there's nothing wrong at all with the audio quality you'd receive. It'll play 33, 45 and, unusually, 78rpm records, a curved dust cover keeps evil motes from infecting your precious plastic and there's a headphone jack for selfless listening. There's better out there. There's cheaper out there. But with speakers, this is a true sweet entry spot. The look's a bit/tragically “hipster”, but this is a genuinely portable deck that folds down into its own suitcase carrier. There are stereo speakers on each side, but RCA outs to cable it to a stereo, alongside headphone ports for your oversized cans and an aux in for your phone's music. It's belt driven, with a fully automatic return arm, something we've not seen in years. Two snags: even when the volume's turned to nothing you'll still get some output through the speakers when you've connected it to another source, and some people find Crossley turntables a bit skip happy. (A pound coin popped on the stylus should address that, BTW.) Mid-level fashion retailers Urban Outfitters sell them. That's probably all you need to know. The TN-300 is a sophisticated, design-led alternative to AudioTechnica's high sepc crowd-pleaser. The cabinet is an eye-pleasing, highly polished MDF designed to hoover up vibrations and skips, on top of which is a die-cast aluminium platter with heavy rubber mat, driven by a high-torque DC motor via a neoprene belt. The straight tone arm specifies the excellent Audi-Technica AT-95E moving magnet cartridge. Although it can occasionally veer towards a smidge muddy, it's a great all-round performer. The minimalist design runs to two selector switches: start/stop and 33/45rpm finish the system. And for straight playback, this is all you'll ever need. It's is a cast iron looker and will do all your vinyl justice. Again there's a pre-amp, so no need for a separate amplifier, and the requisite USB out to your PC. If the AudioTechnica feels a bit button-brimming gimmicky, or too pricey, this is a winning alternative.